Yesterday, Nadeo and Ubisoft unveiled the trailer for the upcoming installment in the ManiaPlanet universe called "ShootMania". Nadeo has taken the exiting ManiaPlanet/TrackMania engine and all content creation tools, etc. and enhanced them to function as an FPS. The software developer geek side of me loves this, as it is a prime example of good software architecture. But more importantly, fans of TrackMania will already be familiar with many of the game's look and feel, including the menus and tools. Even more importantly (to me) -- Nadeo's big push is to keep ShootMania a family-friendly game, not focused on hard-core gratuitous violence like many I've seen lately. ShootMania: Storm looks more like a massive game of "Freeze Tag" in a way (watch the trailer and you'll see what I mean.) The players seem to freeze, then disappear and respawn to get back in the action. 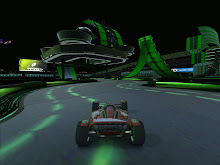 In TrackMania, Nadeo changed the way that we play racing games. They completely removed the element of player collision and pit you against the tracks. It is still competitve because players test their skill in completing the tracks against the other players. ShootMania isn't any different. Nadeo has pulled it back to the basics. From the trailer and some other articles I've read, ShootMania: Storm will be released with 2 simple weapons, and they will leave it up to the community to go crazy and create more; and to leave them free to let their imagination run wild in creating elaborate maps to play in. The simple play will draw both children, casual gamers and hard-core gamers alike. This doesn't mean Nadeo hasn't thought about others. In a video interview with Edouard Beauchemin, product manager at Nadeo, he mentions that they came up with several different weapons, but they really want this to be a community-powered content game like TrackMania is... so they're leaving it at the basics for us to make what we will. I wouldn't be surprised, after what I've seen the community do with TrackMania, if we don't see a new genre of FPS created within ShootMania within 6 months to a year (if not sooner) of the games release this fall. As I mentioned before, TrackMania fans will pick this game up very easily, especially those that build maps... the map editor is the same as in TrackMania, but with blocks and scripting appropriate to the ShootMania world. The trailer is pretty exciting, especially the part where the blue team makes their epic jump over the trees to fly into a red capture point. The end is pretty awesome also. The game is in its "alpha" stage this month, with plans to go "beta" in June. You can sign-up to be a part of the beta at the official ShootMania website. So enjoy the trailer, then sign up for the beta, and welcome in another great product from Nadeo! I hope they'll be making a big reveal at E3 in a couple of weeks! Looks like Nadeo is also including an offline multiplayer (Local LAN) mode in ShootMania:Storm. This is something we haven't seen in too many games lately.